Originally this machine had the Asus motherboard with the P3 600 but about a year later, 800MHz just wasn't so fast anymore. The old P2B was getting long in the tooth and had reached the end of its upgrade path. So, its was time to switch gears and give AMD a shot. Needless to say, the beginning of this CPU mod is the requirement of a new motherboard. I'm not particularily fond of VIA chipsets (having one in my big workstation at the shop) so I decided to try a board with the AMD 761 chipset. I chose the MSI K-7 Master. Woah - this is a HUGE mother of a motherboard! Check it out next to the old P2B. 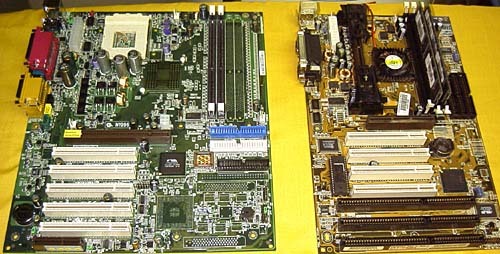 Along with the board, I got a 1.33GHz T-Bird and 512M of Apacer PC2300 DDR ram. The nice thing about these AMD chips is you can overclock not only by increasing the FSB but also by changing the multiplier. To "unlock" the multiplier function, one merely has to reconnect the "L1 bridges". It seems the most popular way of doing this is with a pencil (lead is conductive). However, I decided instead that I would solder them. So, I heated up my iron and laid the chip under my illuminated magnifying glass and what did I see .......... ? So, with that out of the way, I proceeded to mount the big copper SK-6 HSF from Thermalright. This, of course, is when disaster strikes.